1. 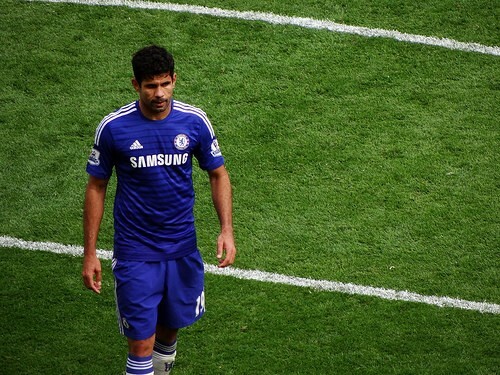 Diego Costa – Signed for Chelsea from Atletico Madrid for a fee approaching £32m, Costa has been a revelation up front for the Blues, registering 15 goals in his first 18 Premier League games. 2. Alexis Sanchez – This season has failed to live up to expectations for Arsenal but Sanchez, signed in the summer from Barcelona, has been a real ray of hope. He constantly worryies defences and creates space for his team-mates. 3. Cesc Fabregas – Having previously starred for Arsenal, Fabregas’ decision to join Chelsea from Barcelona was brave to say the least. But he has been in outstanding form, topping the Premier League’s statistics for assists as Mourinho’s men have stormed to the top of the table. 4. Graziano Pelle – Snapped up by new Southampton manager Ronald Koeman for £8m from Feyenoord, Pelle has been a driving force behind the Saints’ Champions League push. He has scored a healthy eight goals. 5. Ryan Bertrand – Signed on loan from Chelsea, Bertrand has been a revelation in the Southampton defence, which has conceded less than a goal a game on average. Bertrand looks at home at St Mary’s and Ronald Koeman will be desperate to make the deal permanent if his team are to continue to progress. 6. Frank Lampard – Unwanted by Chelsea, Lampard was allowed to join New York in the MLS and has since been loaned to Manchester City. The 36-year-old no longer has the legs to play every game, but he has made some vital contributions this season and he is still a man that can be relied upon in the most challenging situations. 7. Ayoze Perez – Newcastle’s Spanish striker was one of the bargains of the summer. Having scored five goals in the first half of the season, Perez has really given Newcastle a cutting edge and, at just 21, he could blossom in to one of the Premier League’s stars of the future. 8. Angel Di Maria – Arriving at a difficult time for Manchester United, Di Maria appears to have taken his near £60m price tag in his stride and, when fit, is one of the most lethal midfielders in the country. Injury has limited Di Maria’s contribution thus far but, from what we have seen of him, he looks to be a real star. 9. Gylfi Sigurdsson – The Icelander’s return to Swansea City after an unsuccessful spell at Spurs might have turned a few heads but he has slotted straight into Garry Monk’s side. Much of Wilfried Bony’s success up front can be attributed to the 25-year-old’s creativity in midfield. 10. Jack Colback – Making the move from Sunderland to Newcastle took real guts from Colback but, so far, it seems to be paying off for the 25-year-old. Colback has been given a pivotal role in the centre of midfield for the Magpies and has taken the responsibility in his stride, playing a major part in Newcastle’s strong start to the campaign.